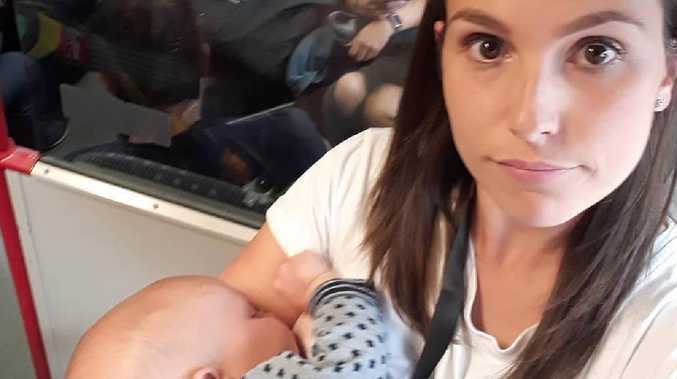 A MUM has lashed out at train passengers in a furious online rant after she was denied a seat while trying to breastfeed her six-month-old baby. Kate Hitchens, 32, was travelling home to London on the train with her young son and was left shocked when no one in the packed carriage gave up their seat for her. "What has the world come to that a mother has to stand up on a moving train breast feeding a wriggling and writhing 6 month old, 20lb baby," she wrote on Instagram. She claims she had to stand for half an hour, all while struggling to nurse her baby. "I could have asked, but I didn't. I felt silly. I shouldn't have to ask. Maybe some people didn't see," she said. "I know for a fact some did; they made eye contact and actually smiled at me. I was thinking stop smiling and offer me your seat please!" Ms Hitchens said that when one lady did notice and jumped up to offer her seat she was left in disbelief when another woman stole it. Despite being informed that the seat was for someone else the woman refused to move and "shrugged, plugged her earphones in and closed her eyes." Ms Hitchens claims she didn't ask anyone for their seat because she "felt silly" and "shouldn't have to." She said she understands people not offering their seat to an elderly person or someone they think is pregnant for fear of offending them but claims there is no excuse for not getting up for a woman and her child. "Next time you see someone with a child on a train - if you're able bodied and fit and healthy please offer your seat to them!"